For the town in England, see Boston, Lincolnshire. Boston is the capital city of Massachusetts in the United States. It was founded in 1630. Boston is one of the oldest, wealthiest and most culturally important cities in the United States. Boston was founded on September 17, 1630, by Puritan colonists from England. Boston's early European settlers called the area Trimountaine (Three Mountains). They renamed the town for Boston, England, in Lincolnshire because many important "Pilgrim" colonists came from there. Most of Boston's early citizens were Puritans. Shortly after Boston's settlement, Puritans created America's first public school and America's first university, Harvard University (1636). Harvard is in the city of Cambridge, which is across the Charles River from Boston. Until the 1760s, Boston was America's largest city. During the early 1770s, the British tried to control the thirteen colonies with taxes. This made people from Boston start the American Revolution. The Boston Massacre, the Boston Tea Party, and several early battles happened in or near the city. It held its first town meeting in Faneuil Hall in 1743. Boston continued to grow and attract immigrants from around the world. Many immigrants came from Ireland, and gave Boston a very Irish culture that remains today. President John F. Kennedy was a member of an Irish-American family that lived in Boston. Many immigrants also came from Italy, and lived in Boston's North End, where Italian culture remains, with various Italian stores, restaurants, bakeries, and homes. On 15 April 2013, two bombs exploded at the Boston Marathon. Boston is located on the Shawmut Peninsula. The city covers 48 square miles. Boston Harbor and the Atlantic Ocean is located east of the city. A much larger metropolitan area surrounds Boston. The highest point in Boston is Bellevue Hill, at 330 feet above sea level. The lowest point is at sea level. Boston is the only state capital in the contiguous United States with an ocean coastline. Boston has a continental climate with some ocean effects. Summers are normally warm to hot, rainy, and humid, while winters alternate between periods of cold rain and snow, with cold temperatures. Spring and fall are usually mild. Existing wind patterns that blow offshore lower the effect of the Atlantic Ocean. The hottest month is July, with an average temperature of 73.4 °F (23.0 °C). The coldest month is January, with an average of 29.0 °F (−1.7 °C). Extremes have ranged from −18 °F (−28 °C) on February 9, 1934, up to 104 °F (40 °C) on July 4, 1911. Boston's location on the North Atlantic moderates its temperature, but makes the city very likely to suffer from Nor'easter storm systems that can produce much snow and rain. The city averages 43.7 inches (1,110 mm) of precipitation a year, with 45.1 inches (1,150 mm) of snowfall per year. The tallest towers in Boston are the Prudential Tower and the John Hancock Tower. Boston has a culture that is quite similar to New England, such as a New England accent and foods that are mostly seafood, salt, and dairy products. Irish-Americans are very important in Boston's politics and religious activities. Boston people also have a style of talking which is called Boston slang. It is often thought that Bostonians have a strong sense of culture. Perhaps this is because Boston is famous for being a very intellectual place, with much of its culture coming from its universities. 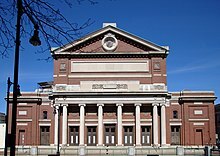 The city has many complex theatres, including the Cutler Majestic Theatre, Boston Opera House, Citi Performing Arts Center, the Colonial Theater, and the Orpheum Theatre. The headquarters of Unitarian Universalism (UU) is located in Boston. The Christian Science movement has also made its home in the Boston area. Boston has many historic places and Bostonians take pride in their city's history. The American Revolution began in Boston, and many of its leaders, such as Samuel Adams, John Adams, John Hancock, and Paul Revere were from the city. Many of the sites from the Revolution are preserved in the city, including Faneuil Hall, the Old State House, Park Street Church, and others. These form the "Freedom Trail", a walk that takes visitors past many historic places in the city. Boston is one of the United States' most important cities in education and health care. Boston and the towns around it contain many of the country's leading universities. Harvard, MIT, and Boston University are some of the most famous. Professional sports are an important part of life in Boston. The Red Sox play baseball at Fenway Park, the oldest stadium in Major League Baseball (1912). The Celtics, a basketball team, and the Bruins, a hockey team, both play at the TD Garden. Boston's football team, the New England Patriots, play in Foxborough, a town 22 miles south of the city. In 2013, the population of Boston was 645,966. The population has grown 9.6% since 2000. Boston has 13,339 people per square mile. The population is 47.8% male and 52.2% female. The racial breakdown is shown in the Racial Groups table. The people from outside the United States are 178,805. 27.7% of the population come from outside of the United States. The unemployment rate in Boston is 5.9% since June 2014. The 35th annual homeless census from 2015 said there were 7,663 homeless men, women, and children in Boston. The homeless population increased 5.6% since 2013. The number of homeless people sleeping on the streets decreased by 22.8% since 2013. However, the number of adults in emergency shelters has grown by 10.9%. In 2015, the homeless family population increased by 25%. The total number of homeless men, woman, families and children increased by 20.9% from 3,541 to 4,281. Mayor Marty Walsh announced his goal to help those in need for a permanent housing solution. Agencies such as Pine Street Inn, Boston Healthcare, Project Hope, and Boston Public Health Commission are helping the homeless. The homeless are helped by reducing family evictions. Property management companies and nonprofits, such as Project Hope and the Department of Neighborhood Development, will increase affordable housing options. Boston Public Health Commission and the Department of Neighborhood Development will work together to provide support for treatment options and shelters. The Wyman Re-Entry Center has a 90-day residential substance-abuse and recovery program. The Safe Harbor serves adults with HIV. The project SOAR stands for Stability, Opportunity, Achievement, and Recovery, and helps clients maintain a healthy lifestyle and provide support in moving to permanent housing. Over 85.6% of the population ages 20 years and over in Boston have a high school diploma or higher in 2013. Those with a Bachelor's degree or higher make up 45.2% of the population. There are many more not listed here. The MBTA runs the city's subway (known as "the T"), commuter rail, buses, and ferries. The main airport for the city is Logan International Airport. Sumner Tunnel Route 1A South 1934 Toll of $3.50 for non-commercial vehicles and $5.25 for commercial vehicles. Callahan Tunnel Route 1A North 1961 Repair work to this tunnel caused complete closure of the tunnel, which began at 11 pm on December 27, 2013 and ended on March 12, 2014. Tobin Bridge 1950-02-27 Is more than two miles (3 km) from Charlestown to Chelsea over the Mystic River in Massachusetts. The bridge is the largest in New England. ↑ 1.0 1.1 "Boston Travel & Vacations". Britannia.com. 2006. Retrieved April 8, 2009. ↑ "Massachusetts by Place and County Subdivision". American FactFinder. United States Census Bureau, Census 2000 Summary File 1. Retrieved April 29, 2009. ↑ "United States by Urbanized Area; and for Puerto Rico". American FactFinder. United States Census Bureau, Census 2000 Summary File 1. Retrieved April 29, 2009. ↑ "United States by County by State, and for Puerto Rico". American FactFinder. United States Census Bureau, Census 2000 Summary File 1. Retrieved April 29, 2009. ↑ "Alphabetically sorted list of Census 2000 Urbanized Areas" (TXT). United States Census Bureau, Geography Division. Retrieved April 11, 2009. ↑ "ZIP Code Lookup – Search By City". United States Postal Service. Retrieved April 20, 2009. ↑ Univ. of Alabama geography dept. "US Map and State Capitals". CSGNetwork.com. Retrieved 2012-07-06. ↑ "Weather". City of Boston. 2013. Retrieved 2013-02-13. ↑ Baker, Billy (2008-05-25). "Wicked good Bostonisms come, and mostly go". The Boston Globe. Boston.com. Retrieved 2009-05-02. ↑ "Boston Culture". Columbus Travel Media Ltd. Retrieved 2010-02-02. ↑ Phelan, Joseph (November 2004). "Boston Marathon". Artcyclopedia. ↑ 15.0 15.1 15.2 City-Data. "Boston, Massachusetts". City-Data.com. Onboard Informatics. Retrieved 16 November 2015. ↑ Data Access and Dissemination Systems (DADS). "American FactFinder – Results". census.gov. ↑ Boston Public Health Commission, (BPHC). "Annual Homeless Census. City of Boston 35th Annual Homeless Census Emergency Shelter Commission. (Winter 2014 – 2015". Boston Public Health Commission. Retrieved 15 October 2015. ↑ City of Boston. "Mayor Walsh Releases Results of 2013 Homeless Census". City of Boston. Retrieved 16 November 2015. ↑ Hanson, Melissa. "Callahan Tunnel closure begins at 11 p.m." Boston Globe. Boston Globe. Retrieved 28 December 2013. ↑ Abel, David (2007-10-23). "Work never stops on Tobin bridge: Costs rising as crews try to maintain old structure". The Boston Globe. This page was last changed on 19 April 2019, at 22:55.